An 18-month-old child born to a Mexican immigrant mother resident in Texas presented with a convulsive crisis in the emergency room.1 Her pregnancy and his birth history were unremarkable. A magnetic resonance imaging (MRI) examination of the child’s brain was performed (Figure 1). The images show several round, ring-enhancing lesions at the gray matter-white matter interface measuring approximately 1 cm in diameter. Each is associated with vasogenic edema, but there is no midline shift or subfalcine or transtentorial herniation. Differential diagnoses: Pyogenic abscesses, tuberculomas, metastases, tuberous sclerosis, and toxoplasmosis. 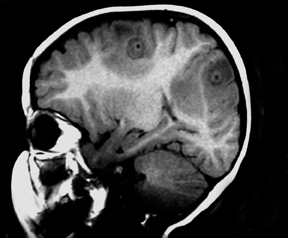 Neurocysticercosis results when encysted larval forms of Taenia solium (pork tapeworm) invade the central nervous system.2 It is the most common parasitic disorder of the CNS,5 occurring in 4% of autopsy series from endemic countries of the world (in Latin America, Asia, Africa, and some European countries). 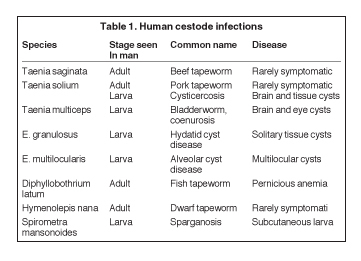 Taenia solium is one of the 8 cestode species that infect man (Table 1). Humans are the definitive host for the parasite (harboring the adult worm), while omnivorous or herbivorous vertebrates (like pigs) host its larval form (intermediate host). Although the adult forms of the cestodes that humans host rarely cause harm, the larval forms cause variable degrees of illnesses in humans. In the former case the parasites often reside harmlessly in the bowels, while in the latter they invade the tissues. For example, in the pork tapeworm’s normal life cycle, humans harbor the parasite and shed its eggs (either individually or in proglot tides impregnated with eggs) in our feces. The pig, an omnivore and its natural intermediate host, consumes the eggs of the parasite, which hatch into larval forms in its alimentary tract and invade its tissues. Consumption of undercooked meat from infected pork by humans completes the cycle, freeing the encysted larvae when they encounter gastric acid and bile salts. 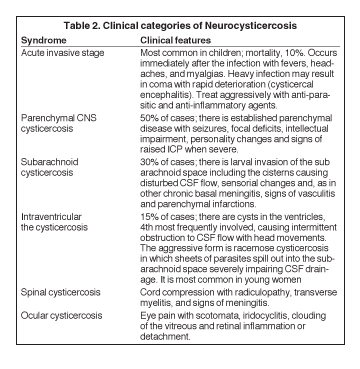 In the CNS, the cysticerci (the larvae) may lodge in the brain parenchyma, the spinal cord, the subarachnoid space, or the ventricles, lying dormant for years or causing various categories of clinical disease (Table 2).5 However, 2 to 10 years after CNS invasion, the dormant cysts may die, lose osmoregulation, absorb fluid and disintegrate, releasing antigens that set up variable degrees of inflammation. The clinical conundrum that results from CNS larval invasion depends upon the size of the invasion, and the location and degree of the inflammation. For cysts that cause symptoms outside the CNS, surgical resection achieves a cure. Two cautionary injunctions about treatment: First, 20% of patients with parenchymal cysticercosis worsen symptomatically following institution of drug treatment as the parasites die and release their antigens. Concomitant administration of antiinflammatory drugs subdues this phenomenon. Second, because anti-inflammatory agents alter the CNS pharmakokinetics of the anti-parasitic agents, their routine use is discouraged. Patients should be rescanned 3 months after therapy to judge their response to treatment; an alternative drug to the one used ab initio can be used if there is no response. For patients with ocular cysticercosis (remember, 20%), it is preferable to hold off drug treatment until resection of their lesions because they do not respond well to medication. 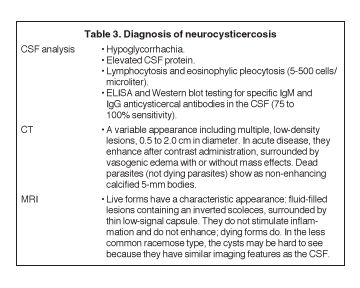 MRI is an effective examination for evaluating neurocysticercosis and other similar conditions. 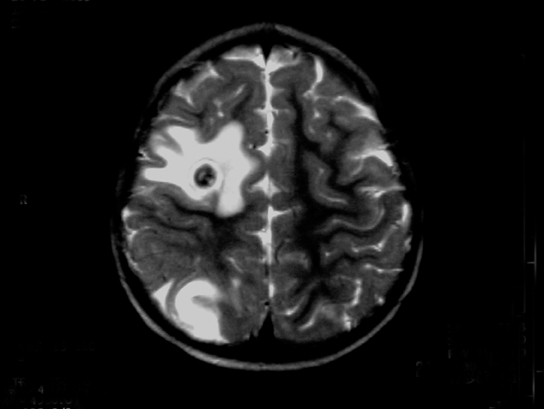 Utilizing techniques, such as axial T1W image after IV gadolinium administration, axial T2W image, and coronal FLAIR images, effectively depicts enhanced views of the lesions at the gray matter-white matter interface. Shandera WX, White AC Jr, Chen JC, et al. 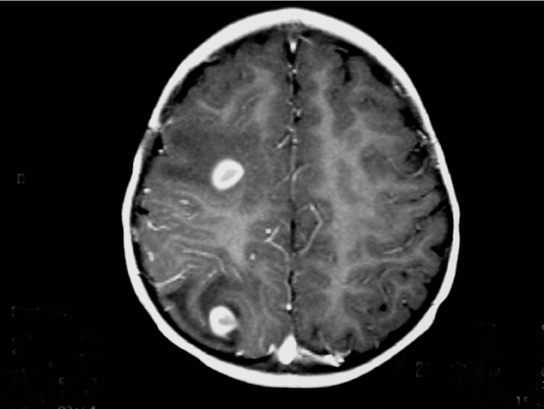 Neurocysticercosis in Houston, Texas. A report of 112 cases. Medicine (Baltimore). 1994;73:37-52. 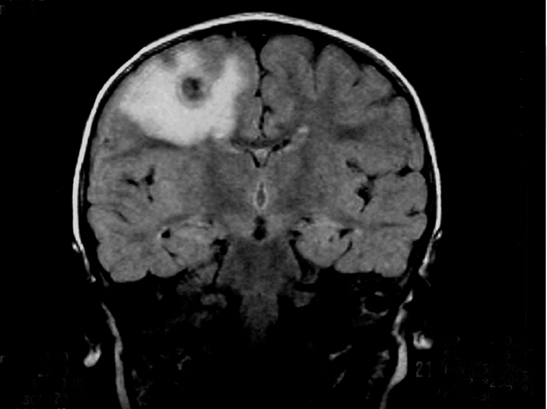 Ruiz-Garcia M, González-Astiazaran A, Rueda-Franco F. Neurocysticercosis in children. Clinical experience in 122 patients. Childs Nerv Syst. 1997;13:608-612. Riley T, White AC Jr. Management of neurocysticercosis. CNS Drugs. 2003;17):577-591. Rahalkar MD, Shetty DD, Kelkar AB, et al. The many faces of cysticercosis. Clin Radiol. 2000;55:668-674.